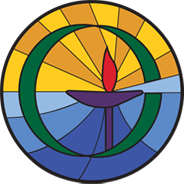 We come together as Open Circle Unitarian Universalist Fellowship open to experiencing transcendent mystery and wonder, honoring diversity and religious freedom. We come to pursue Unitarian Universalism’s prophetic vision of peace, justice, compassion and sustainability and to create Beloved Community. To be a transforming presence in the lives of individuals and the Fond du Lac community. The first sentence of the mission statement says who we are. In saying that we are "open to experiencing transcendent mystery and wonder," we are saying that we are religious or spiritual people. The UUA identifies "direct experience of that transcending mystery and wonder, affirmed in all cultures, which moves us to renewal of spirit and an openness to the forces that create and uphold life" as the first of six sources upon which Unitarian Universalism draws. As persons with individual and diverse spiritual experiences, we honor diversity, in its many forms, and religious freedom. Beloved Community is built through the pursuit of Unitarian Universalism's prophetic vision of peace, justice, compassion and sustainability. Much of our UU statement of Principles is captured in those four words. Many find that our experiences of transcendent mystery and wonder both compel and sustain us in seeking to create Beloved Community. Thus, who we are supports what we do, and what we do nurtures and affirms who we are. The vision expresses what we seek to accomplish through our coming together as spiritual/ religious people in pursuit of peace, justice, compassion and sustainability and working to create beloved community. In 2003 several families sought a faith community in the Fond du Lac area that embraced a commitment to social justice, including welcoming and affirming gay, lesbian, bisexual and transgender persons (GLBT). One of these families hosted a gathering December 7, 2003 to explore the possibility of forming such a community. The gathered group of approximately 25 people decided to move forward in exploration of forming a new faith community in Fond du Lac. In winter/ spring 2004 a series of programs was offered on Unitarian Universalism at Marian College with support and assistance from Fox Valley UU Fellowship in Appleton, WI and Prairie Lakes UU Fellowship in Ripon, WI. A service of discernment was held May 16, 2004 at the Sisters of St. Agnes Convent Chapel and the group decided to form a congregation and seek affiliation with the Unitarian Universalist Association (UUA). The name "Open Circle Unitarian Universalist Fellowship" was chosen in summer 2004. Our first Sunday worship service was held September 19, 2004 in the Camelot Children's Center. We overflowed the space our first Sunday, and by November had relocated to the Combined Building on Main Street. During the 2004 -2005 program year we adopted bylaws and became incorporated. Application for membership in the Unitarian Universalist Association was submitted in summer 2005. In fall 2005 we welcomed Bill Neely as the first of a series of student ministers from Meadville Lombard Seminary in Chicago. In fall 2007 the congregation purchased an old print shop building at 19 E. Third Street. Many hours of planning and hard work went into transforming this building into a welcoming and functional home for Open Circle. The Third Street building was dedicated September 21, 2008 with Rev. Scott Prinster leading the service. In December 2008 the sanctuary was named "The Erica Sanctuary" honoring Erica Bowman, the young woman who provided the impetus for the formation of Open Circle UU Fellowship. 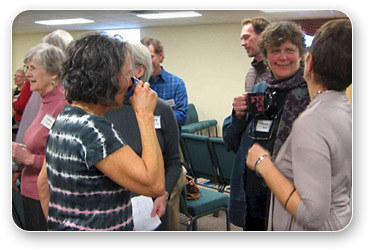 In fall 2009 Open Circle celebrated its designation as a "Welcoming Congregation by the UUA. In 2012 Open Circle was certified as a Green Sanctuary Congregation. In 2013 the Fellowship received a Chalice Lighter's grant to assist with establishing ongoing consulting ministerial services. Today Open Circle UU Fellowship is a vibrant community of about 65 members committed to our mission of pursuing peace, justice, compassion, sustainability, and creating Beloved Community. We are strengthening our lifespan religious education programs, and seeking new ways to be a transforming presence in individual lives and in our community. We invite you to join us in writing the next page of our history. The mission of the Open Circle Caring Circles is to provide short term, personal and compassionate member-to-member support as needs arise, with such things as meals, transportation, child care, respite care, and notes and cards. Note: Caring Circle vs. Lay Pastoral Care: The Caring Circle differs from lay pastoral care in that the latter provides more specialized services to support members in time of grief, marital changes, unemployment, etc. Lay pastoral care requires more in- depth training for volunteers than does the Caring Circle. Open Circle does not provide pastoral care at this time. The purpose of the Common Ground Team is to keep the Covenant of Community a living presence in our fellowship life, serving as a resource to facilitate positive communication and relationships. The common ground team is charged with establishing and periodically updating guidelines for conflict resolution in OCUUF, is empowered to make recommendations to the board and congregation about ways to promote and improve a healthy beloved community, and will also be available as mediators and a resource to the OCUUF community. The Décor Committee is charged with creating and maintaining a functional, attractive and welcoming space at our Fellowship. The committee selects and places the furnishings, decorative art and accessories within the building, and selects wall color and flooring. While the Facilities Committee is responsible for maintaining the Structure, modifications that impact the appearance of the building will be done in collaboration with the Décor Committee. The committee is mindful that our building “communicates” many Messages about Open Circle. This poses challenges as well as opportunities. The committee seeks to reflect and respect the diversity of beliefs within the Fellowship as well as our UU Principles, while maintaining cohesion in the overall appearance of the building. The purpose and scope of Earth Justice Now is to focus efforts on care for the earth in general, and climate change in particular. It seeks to cooperate with other like-minded individuals and organizations answering the urgent call to all people to work together to mitigate the degradation and destruction of life on earth brought on by human actions. The purpose of the facilities committee is to provide and oversee the maintenance of the OCUUF building. This includes making minor repairs to ensure that no major damage or deterioration occurs unnecessarily, and hiring professionals when needed. The purpose of the Hospitality Committee is to provide coffee and tea and to arrange refreshments for after-service “coffee hour.” Also, to host coffee hour and clean kitchen area afterwards including washing dishes, saving leftover food, disposing of trash and taking home laundry. Coffee hour can last about one hour. Chair will oversee host assignments and Sunday refreshments. Chair will also purchase supply of coffee, tea, some fruit juice drinks and paper products. The purpose of the New to UU Committee is to welcome newcomers to the Fellowship, to help them to learn about Unitarian Universalism and Open Circle UU, and to support them in making decisions about their commitment to the Unitarian Universalist faith and to Open Circle. The Ministerial Leadership Committee is charged with leading OCUUF in the consideration of retaining ongoing ministerial leadership for the Fellowship. The committee will lead a Fellowship conversation and assessment relating to views within the Fellowship regarding the pros and cons of seeking ongoing ministerial leadership, and the skills, traits and expectations the members have for a staff minister. The committee will work with MidAmerica Region UUA staff to obtain information about the costs and process of obtaining ministerial leadership and on educating the Fellowship on these matters. The committee may consider shared positions with neighboring fellowships. The purpose of the Nominating Committee is to recommend candidates for Board positions, confer with the Board to fill any vacancies which occur between Annual Meetings, recommend candidates to serve on the Nominating Committee, assist the Board in identifying members for leadership training, and assist in the development of congregational leaders. The purpose of the Religious Education Committee is to nurture and honor the continual spiritual growth and identity of children, youth and families. Our congregation-centered program provides a living faith foundation based on UU principles and sources. The children are encouraged to develop their own personal beliefs and to celebrate the diversity of religious traditions. The purpose of the Service Planning Committee is to assure that quality services and other spirituality education or nourishing fellowship activities are programmed each Sunday during the service year. The committee seeks input from fellowship members to ensure their preferences are aligned with the programming. The committee identifies and addresses needs related to service provision, e.g. songbooks, candles, batteries for microphones, etc. The Social Justice Now team focuses on pursuing social justice work in line with Unitarian Universalism’s first, second and sixth principles. Social Justice Now works for justice, equity and compassion in society, including by supporting the Equality Project which works to end stigmas against LGBTQ+ individuals. The Stewardship Committee is responsible for oversight of all fellowship financial operations and investments. The committee organizes and conducts congregational pledge drives and convenes annual meetings. The purpose of the Book/Video Club is to create connections (Beloved Community) among attendees, be they OCUUF or local community members interested in being part of a book club and meeting other people. This open group meets monthly throughout the year and chooses the films/books based on the discussion of the attendees. Chalice Circles are small groups of approximately 6-8 people who meet regularly to deepen their relationships with each other and to grow spiritually. Chalice Circles provide an open and supportive environment in which the inherent worth and dignity of each community member is respected. An environment that specifically promotes making connections and developing friendships within the Fellowship and supports spiritual growth and the search for truth and meaning. Each “Circle” decides on the frequency, time and place of their meetings. Once a Circle is formed, there is a commitment to meet together for at least one year. Earth Spirit is a group for those who have an interest in Earth/Nature-Centered spirituality, including Wiccan, Native American, and other Pagan paths. The group celebrates the Pagan Sabbats with a gathering, ritual and potluck feast. All Earth Spirit events are alcohol-free, and children are welcome if supervised. The Men’s Group is an open group that meets the first Sunday of each month. Coffee time begins at 8 AM, with check-in and the start of the meeting at 8:30 AM. Their credo is “you are not alone”. The check-in allows for personal sharing, followed by discussion of an issue relevant to the men present. This is a group that permits deep sharing in a trust-based, confidential environment. WOW is a group of women who gather the first Monday of every month for open discussion centered around individual views of spirituality and its implications in women’s lives. Some of the topics that have been discussed are world religions and personal beliefs, styles of meditation, aging, death and the afterlife, and mindfulness. The group meets on the first Monday of each month, gathering at 9:30 AM for coffee with the discussion beginning at 10 AM. The meetings generally end at 11:30 AM.